Urban Planner is Torontoist’s daily guide to what’s on in Toronto, published every morning. If you have an event you’d like considered, e-mail all of its details—as well as images, if you’ve got any—to [email protected]. 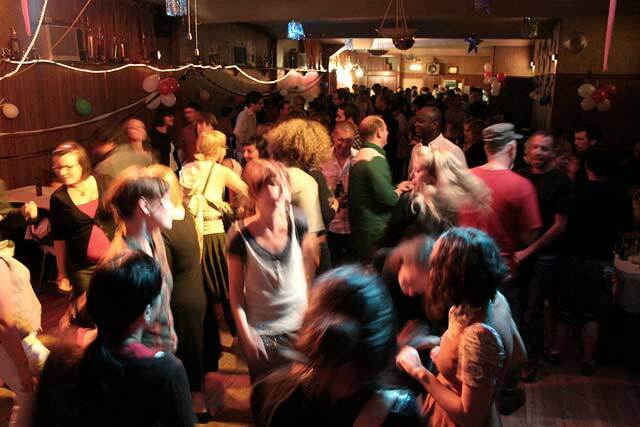 Photo of Spacing‘s September 2008 release party by Yvonne Bambrick, courtesy of Spacing. PARTY: In Spacing magazine’s newest issue, “Grey Spaces//Where the City Blurs,” contributors examine spaces like libraries, airports, community centres, and shopping malls: publicly accessible places with a set of societal or legal rules that apply upon entry. The release party takes place tonight at the Canadian Corps Hall, where games and door prizes await. DJ trio Track Meet—comprised of Eye editors and writers Ed Keenan, Dave Morris, and Paul Issacs—will spin the tunes. Canadian Corps Hall (201 Niagara Street), 7:30 p.m.–1 a.m., $10 with a copy of the magazine, $5 for subscribers. WORDS: Author, commentator, and filmmaker Richard Poplak travelled to Egypt to observe the debut of Al Shamshoon, an Arabized version of The Simpsons. In his new book, The Sheikh’s Batmobile: In Pursuit of American Pop Culture in the Muslim World, Poplak examines how North American cultural obsessions, such as pop songs, sitcoms, Hollywood films, and shooter video games, make their way into contemporary Islamic culture. He delivers a multimedia presentation based on his findings at tonight’s This Is Not A Reading Series. Tattoo Rock Parlour (567 Queen Street West), 7:30 p.m., $5 or FREE with book purchase. MUSIC: Juno Award–winning saxophonist Richard Underhill leads his jazz quintet and the electronic groove ensemble Astrogroove for a fundraising concert tonight. The funds will support Clay & Paper Theatre, a drama troupe specializing in productions with large-scale puppetry. The event also features fire-spinning by the New Model Circus Army, door prizes from This Ain’t the Rosedale Library, and a performance from the Clay & Paper Revolutionary Chorus. Supermarket (268 Augusta Avenue), 8 p.m., $15 advance, $20 at door. FILM: Sprockets, the Toronto International Film Festival for Children, continues to April 24. Over a dozen films will be screened today, and the highlight is the award-winning The Wave. Based on a true story, the film recounts a high-school teacher’s unusual experiment: to help his students understand life under a dictatorship, he simulates fascist rule within the classroom. The experiment goes out of control as the students begin to accept and welcome the very ideology they denounced, and the social unit takes on a life of its own. A Q&A discussion follows. Cineplex Odeon Sheppard Grande (4861 Yonge Street), 10:15 a.m., $10.61 adults and $6.50 for children. CHARITY: Erika Ritter hosts “Creature Comforts,” a benefit evening of readings and music about our relationship with animals. Participants include journalists Christie Blatchford and Joe Fiorito, CBC’s Andy Barrie, Soulpepper Theatre’s Nancy Palk, singer-songwriter Melanie Doane, and playwright Ted Dykstra. Proceeds from the event go to Fred Victor Centre’s pet-friendly homeless shelter. Theatre Passe Muraille (16 Ryerson Avenue), 8 p.m., $10 at artsboxoffice.ca.